When my husband and I lived in the Fayetteville area during our first round at Fort Bragg we never went to downtown Fayetteville outside of the day we were married and to pick up our boy’s birth certificates. Back then we were always told to avoid the area. I can remember hearing about how they were trying to revitalize the area and every now and then I would hear about something that was going on. After being away eight years things have changed and I can safely say that staying away from downtown is NOT advice anyone should take. Downtown Fayetteville is full of places to explore, eat and shop! It is an area of Fayetteville I am still exploring so I was disappointed I missed part of the adventure my fellow bloggers went on during the Fayetteville Familiarization Tour. Luckily though I was able to check out the Dogwood Festival and Fourth Friday with them and check out some areas I really need to go back and explore! Fourth Friday has been held in some way or form for the last about 15 years. Every Fourth Friday of the month part of downtown is closed where you can walk on the streets. There are exhibits, all sorts of free entertainment as well as food and drinks that come to together in historic downtown Fayetteville. It is a very relaxed and fun atmosphere. On the Friday that we went we first came across a set up by the Climbing Place, where you could climb and race to the top of the rock wall. It was busy and we watched as father’s raced their children up the rock wall to see who would be first. They were amazing! Aerial silks have always amazed me. Simply the upper body and core strength that is needed to do this amazes me! I learned afterwards that there was even an exhibit inside of Market House. Honestly there is so much to do it is very easy to miss things with everything going on. Just exploring I was making a mental list of all the places that I needed to come back to and visit. Fourth Friday was definitely a good way to get out and explore downtown Fayetteville! In addition to Fourth Friday the Dogwood Festival was going on. The Dogwood Festival has been around since the early 80’s. Much like Raleigh is the city of oaks Fayetteville is the city of dogwood’s, giving the festival it’s name. The festival which is held every 4th weekend in April, hosts local and national music artists, arts and crafts,plenty of food and of course fun! Friday night’s featured artist was country singer,Craig Campbell. 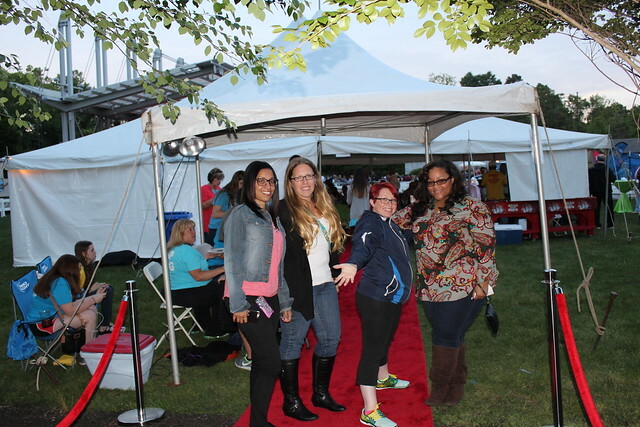 As part of the blogger familiarization tour we were given the VIP treatment and hung out at the VIP tent but not without first walking the red carpet. I have to say that red carpet sure can make a girl feel special. 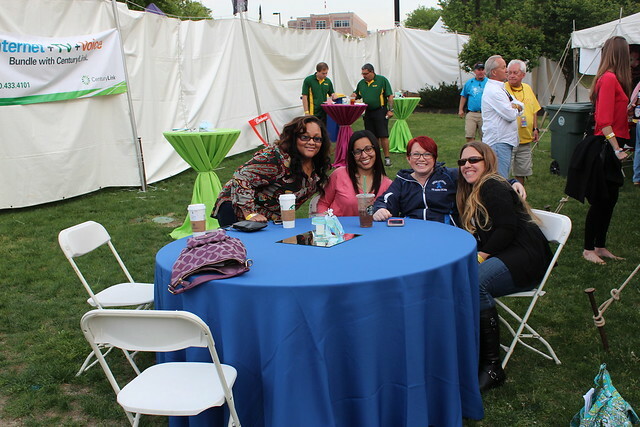 We were able to sit back and relax while waiting on the night’s headliner. While in the VIP area they served a buffet dinner from Hilltop House, another great local restaurant that serves contemporary southern food. One of the best buffets I have had since I became gluten free. The tiny potatoes I had were my favorites! All that was left was to wait on Craig Campbell’s who eventually came out after 9:30. He started off his set with Brooks and Dunn’s, Play Something Country and the crowd loved it! His concert closed out an eventful day. Are you interested in Fourth Friday and want to check it out? Want to learn more about Downtown Fayetteville?